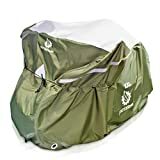 To keep this bicycle cover well-fitted onto your bike, the cover has elasticized hems on the front and the back and a middle clasp buckle for extra for extra fitting. You should consider the following important things when buying the bicycle cover. The material used to a bicycle cover is probably the biggest consideration before buying a bicycle cover. 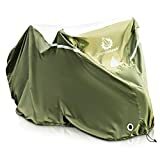 The best bicycle cover is one made of high-quality material and thick enough to ensure it lasts longer and does not tear when taking it off the bike. Majority of the manufacturers in the market use the polyester material which is indeed quite a strong material. However, the difference comes in terms of how thick the polyester is. A 600D (600 Denier) polyester material in a bicycle cover compared to 400D or 240 D, the 600D is thicker thus more durable than the latter two materials. Ideally make sure the bicycle cover you buy is of 600D polyester, covering both the top and the bottom. A bicycle cover with lock holes allows you to lock your bike for safety purposes, especially if you do leave your bike outside for a long time. Therefore be sure to check if the bicycle cover has a lock a hole from where the bike can be locked to a post or a railing. The lock holes in some bicycle covers are made of metal which by itself is not bad until the metal holes start to rust. Stitched holes are a bit better if you are using a bicycle cover for rain, snow or ice protection; all of which can increase rusting if metal lock holes were to be used. The 600D polyester used at the top cover material for this bicycle cover is not only tough enough for durability but also offer protection from heat and UV rays. Unlike bicycle covers made of a less tough polyester material, like 210T polyester, the thickness of the 600D polyester on the Yardstash bicycle cover guarantees the covers durability. Moreover, the inside of this bicycle cover is reinforced with a rather tough material the 210D polyester. Though not as tough and thick as the exterior 600D polyester, the 210D polyester also offers maximum protection from rain-water droplets or dampness from snow. Additionally, considering the exterior is made of a tougher and thicker material, the blend of this two material offers more than enough protection. If your significant other is into bikes as much as you, you might consider getting the Yardstash bicycle cover. This bicycle cover will shield both of your bikes from wind, sun and rain thanks to its large size. As a matter of fact, what makes the Yardstash one of the best-rated bicycle covers, is its extra-large size. This means that you can use it to cover all kinds of bikes with various sizes, from electric bikes to beach cruisers. With a dimension of 82 inches long by 30 inches wide and 44 inches tall, making this bicycle cover offer sufficient room to cover your bike inclusive of all its attachments such as a basket or rack. If you often store your bike outside or leave in an area with windy conditions, a bicycle cover with elasticized hems is one of the best investment you can have on your bike. The elasticized hems make the bicycle cover fit well, if not perfectly, on the bicycle. This comes in handy when your bicycles wheels from dust and dirt. The Yardstash bicycle manufacturer did a good job in designing the elasticized hems on the front and the back so that the bicycle cover is not blown off the bike especially on a windy day. The additional middle clasp buckle is also a huge plus since it reinforces the cover making it fit onto your bike. Protecting your bike from harsh weather condition is one thing while protecting it from thieves or from a bad soul that may want to vandalize your bike, is another thing. And finding a perfect blend for the two is more than an advantage. With the metallic lock holes on the front of the Yardstash bicycle cover, you not only protect your bike from damage by weather conditions but also keep it safe from thieves. The lock holes allow you to lock the front wheel on to a post or trail thus keep your bike safe. Although some bike owners may argue that having the lock holes on the front side is not secure enough, since a thief can also unlock the front wheel and walk off with the bike; it is highly doubtful if all that can happen without one noticing. Hey! Unlocking a bicycle’s wheel is not like it as it sounds more so it takes a significant amount of time. For a pro bike cover like this one with a highly durable material, a two-year guarantee is a more of an assurance of the covers durability. Thus you can purchase the Yardstash bicycle cover with confidence that it will last longer. Besides, even if the cover lacked a guarantee of any kind one can take comfort in the fact that the cover it is made of a tougher material compared to other covers. Though not an essential feature, it is a good idea to have reflective strips on a bicycle cover. It is common for people to travel by car with their bikes and then cover them on top of the car’s bike carrier. In such a case, a bicycle cover with reflective strips helps keeps things visible and a little bit safer especially if you are traveling at night.